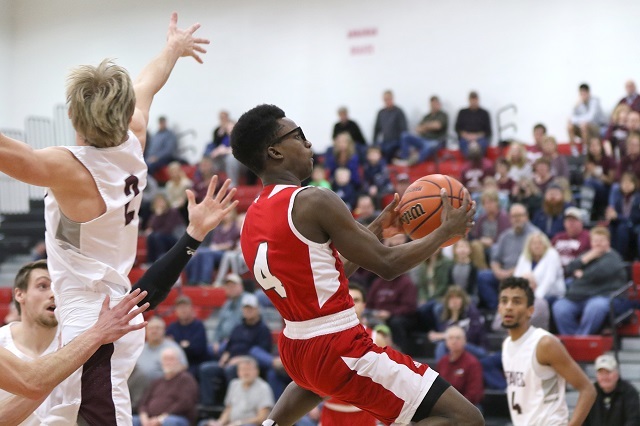 There were moments in the first half on Tuesday, and even at halftime, where Mooseheart fans entertained thoughts of an upset victory for their boys basketball team against favored Annawan in the Class 1A Ottawa Marquette Sectional semifinals. The Ramblers succumbed to a combination of Annawan second-half defense and solid shooting and Mooseheart’s season ended following a 53-33 victory in a game played at Marseilles Elementary School. Mooseheart (16-7) had leads in the first half and only trailed 28-21 at halftime. Where the Braves (28-3) surged in the second half, the Ramblers struggled, scoring 12 second-half points. “We had to work hard for our shots, and they made us change our shots. At the same time, we had shot the ball exceptionally well in the tournament until tonight, and we missed some shots that we had been hitting,” Daneels said. Graduation hits Mooseheart hard as core seniors Styles Redmond, Edgar Yusuf and Wendell Lanphier and graduate. “These were guys who, as freshmen, saw the basketball team get to a regional final and lose. They wanted to get to a regional final and win, and they did that. They’re going to leave a big hole,” Daneels said. Sophomore Na’Shawn Howze led the Ramblers with 16 points while junior Mike Lowe added 11. “We played a team tonight that’s been to the sectional for a couple of years and their goal now is to try to win the sectional. I’d like to see us build into that type of team too,” Daneels said. Owen Landwehr led Annawan with 21 points. Dante Weathersby and Ben Buresh added 10 points apiece for the victors, who advance to Friday’s sectional title game against the winner of Wednesday’s Aurora Christian-Kewanee Weathersfield contest.